The anti-insect PVC STOP-INSECT is specifically recommended for strip curtain doors and partitions that will encounter insects. It will efficiently repel insects and prevent infiltration of areas like schools, hospitals, health centres, factories, industrial workshops,commercial shops, public buildings, and preivate residences. The repulsive agent within STOP-INSECT is perfectly safe for humans and recommended by WHO (World Health Organisation) to prevent mosquito-borne diseases such as Dengue Fever and Malaria. Kills up to 100% of mosquitoes in contact with the vinyl. Safe, repulsive agent recommended by WHO. From forklifts to heavy equipment, the ASSA ABLOY UltraBig high-speed rubber door handles openings as large as 50’ x 35’ with speed and reliability in the harshest environments. The ASSA ABLOY HS9010PFR is designed for freezer environments, allowing efficient traffic flow while minimising temperature variations. The high operating speed combined with an excellent seal optimises the internal traffic flow and provides energy savings. 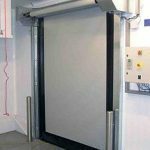 The door can be set to open automatically every 20-25 minutes to avoid build-up of ice on side-guides and curtain.